July 26th and 27th, 2014: Maple Ridge / Pitt Meadows Country Fest and Backyard Farming Exhibit. This is a great opportunity for new brewers to learn from experienced brewers! 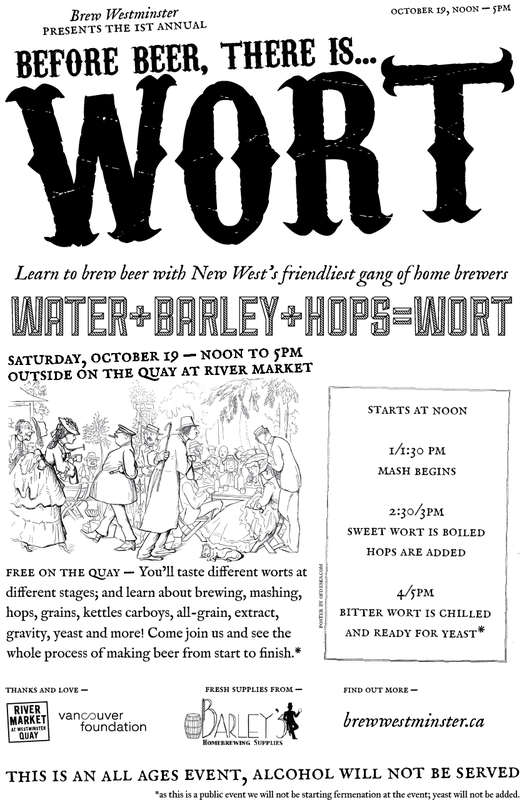 Learn about all-grain brewing and share ideas with like-minded folks on Wort Day! This event takes place on Saturday October 19th from Noon to 5pm on the Quay at the River Market in New Westminster (Please click on the image above for full details). Rain or shine! There will be tents. Barley’s Homebrewing Supplies welcomes its next guest speaker: Gary Lohin, Central City Brewmaster! Come meet Gary and find out what it took to become the head brewmaster at one of British Columbia’s (and Canada’s!) most successful micro-breweries. Bring your questions and learn from one of the best in the business! Come hang out between Braid Street and Sherbrooke Street for the annual Sapperton Day Street Festival! Live music, food vendors and events for the whole family. Barley’s Homebrewing Supplies welcomes its next guest speaker, Chester Carey, Canada’s first certified Cicerone! “Certified Cicerone“ is the second level of certification in the Cicerone Certification Program. “Those who achieve this certification have a deep and well-rounded knowledge of beer and beer service as well as competence in assessing beer quality and identity by taste.” So, basically, it’s the coolest job in the world. Expect Chester to talk a bit about being a Cicerone and his story about how and why he became a Cicerone. He will also be discussing a still-undecided topic, which I’m sure will prove to be very interesting. This guy knows his stuff! Barley’s Homebrewing Supplies welcomes Tim Hazard from Bitterbine Hop Company! Bitterbine is a hop farm located near Lillooet, B.C. and they grow certified organic hops. Ever wondered what goes into hop farming? Now is your opportunity to learn! What are some of the challenges Tim and Sam, a couple of biologists, faced when they decided to take on the task of starting a hop farm – an organic hop farm! Learn about which varieties can grow in Lillooet’s climate and why. Do some varieties present more of a challenge than others? What affects alpha acid percentages and how does one test for that? How do hops grow? How are they harvested? What kind of pests are a nuisance and how does an organic hop farm deal with them? Learn about the advantages of going organic and, best of all, support a local industry. Whether you’re a lifelong brewer or interested in getting started with your first batch of homebrew, come check out Barley’s Homebrewing Supplies on Saturday Feb, 9th for our grand opening. Stop by between 10:00 and 6:00 for complimentary tea and coffee. Start brewing! Barley’s has all the equipment you need to start brewing your own amazing beer in a convenient grab-and-go kit. Normally $76.00, these kits will be sold at 20% off – only $60.80. Delicious snacks will be available after 3:00pm, compliments of Bella Cakes & Pastries. At 4:00 pm, Graham With, brewmaster at Parallel 49 Brewing Company and president of Vanbrewers, will be giving a presentation. 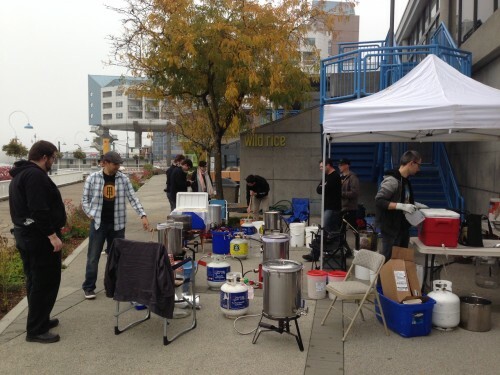 Hear how this homebrewer worked his way up in the world of commercial brewing. He’s likely to offer tips and advice on your own homebrewing experience so come prepared with your questions. Expect some Parallel 49 swag giveaways too! Enter to win a chance to compete in the Coopers brewing contest. Five people will be given a free Coopers kit of hopped malt extract. Do whatever you want with it – Dry hop, mash some grain, experiment with yeast or even brett, whatever you need to do as long as the Coopers extract is in there. 6 weeks later, return with your brew for judging (best of show). The winner will be presented with a $25.00 gift card for Barley’s Homebrewing Supplies and the runner-up will be given a $10.00 gift card. If you want to have your name entered to win one of the five Coopers kits, let me know in person at Barley’s or by emailing me, info@barleyshomebrewing.com, The draw will occur on February 9th at 5:00pm so be sure to enter your name by then!